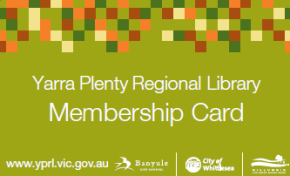 Yarra Plenty Regional Library (YPRL) is committed to serving the information and recreation needs of the community. The Library strives to provide a welcoming environment, and provides free public access to the internet to support lawful access to information and services; access to recreational material; and avenues for community engagement and participation. Users of Internet access through YPRL are expected to abide by the following Terms and Conditions and the library reserves the right to terminate Internet and/or Computer access privileges of any person abusing these Terms and Conditions. This policy follows the principles of the Australian Library and Information Association’s Online Content Regulation statement and the Public Libraries Victoria Network statement on Internet filtering and content regulation. Material found on the Internet may be protected by Copyright. Before using the Internet, you are asked to read the Copyright Regulations which are located near the computers. Internet users are responsible for complying with all copyright and software licencing requirements and any relevant laws and legislation when accessing and/or printing material from the Internet. YPRL promotes and supports young people’s access to information, including electronic information through its Internet facilities. Library staff are available to assist young people in the use of the Internet, and to recommend websites on particular subjects. Parents/legal guardians are responsible for monitoring access to the Internet for children under the age of 18. This is in accordance with library policy in regard to access to any library material. You must be sensitive to the values and beliefs of others when displaying potentially controversial information or images on computer screens located in public areas. Where a user is found to be using Library computers to access pornographic, offensive material, or for any unlawful purpose, the Library reserves the right to direct the user to leave the Library, to direct that the user not re-enter the Library for a specified period and to report unlawful conduct to the relevant authorities. If you encounter any instances of inappropriate use this should be reported immediately to library staff. You should be aware that some library users access sites that others may deem inappropriate and do not close the website windows at the conclusion of an Internet session. A public library has a role as an unbiased source of information and ideas, including online content. YPRL provides free access to materials and information presenting, as far as possible, all points of view on current and historical issues, including controversial issues. The Library does not use censoring software as it inhibits free access to information and it does not provide adequate protection for children from all material that may be harmful on the Internet. YPRL strongly recommends all children be accompanied by an adult caregiver when using the internet. YPRL cannot be held responsible for the validity or accuracy of information, technical difficulties or service interruptions. You must not attempt to modify settings and library hardware, to protect system integrity. Privacy and confidentiality cannot be totally assured in the use of any online resource and the security of data and networks cannot be guaranteed. Computers are for general use and should not be regarded as secure. You should log out of services and refrain from entering highly sensitive information (eg. tax file numbers, banking details) while using library facilities. The library cannot assume responsibility for any loss of data, funds, or identity theft that may result from use of the internet in the library. At the conclusion of each Internet session ensure that all opened web browser windows are closed. Do not leave passwords on display. Communications over a wireless network are not secure. Information sent from or to a laptop can be captured by anyone else with a wireless device and appropriate software. You should be aware of the risk in using wireless access in the library. If you use your own internet enabled devices, appropriate use of those devices and any associated behaviour within the library is governed by the Internet Access Policy. All Internet use is logged for statistical purposes. Data provision assists the library service to continually maintain and improve Internet services. No information is collected to the detriment of individual privacy. To provide equitable access, time limits and particular functions are displayed for each computer work station. You are asked to comply with these limits, for the benefit of all. Failure to do so may result in your Internet access being curtailed.